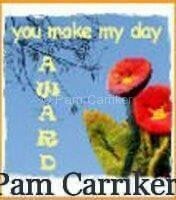 The next one I would like to give this award to is Gail Schmidt! She is such a doll! She is the one who designed my header and has been ever so helpful with http://www.shabbycottagestudio.blogspot.com/adjustments to it so I can use it on my etsy store too. You really need to check out her stores. Thanks Gail!!!!!!! !